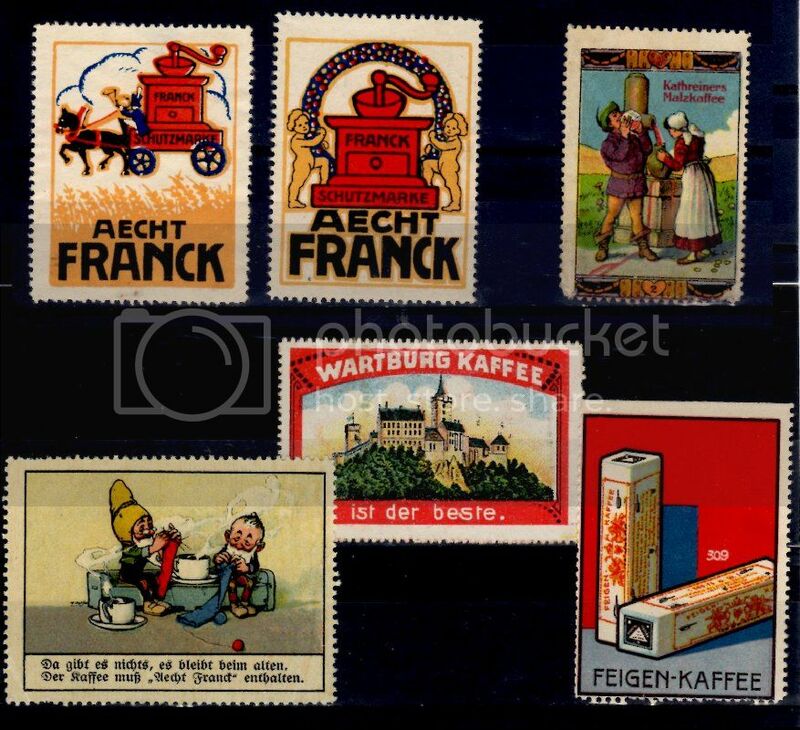 I have been accumulating a small collection of German poster stamps advertising coffee, or in some cases more specifically coffee substitutes. 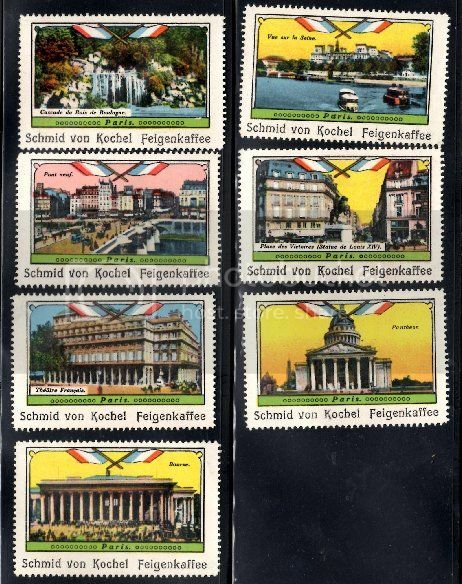 There seems to be one major company issung collectors stamps, often in series - Aecht Franck. From a rival firm. Not only is it an identical product in a virtually identical container, but the stamp design down to the colours and layout very similar. 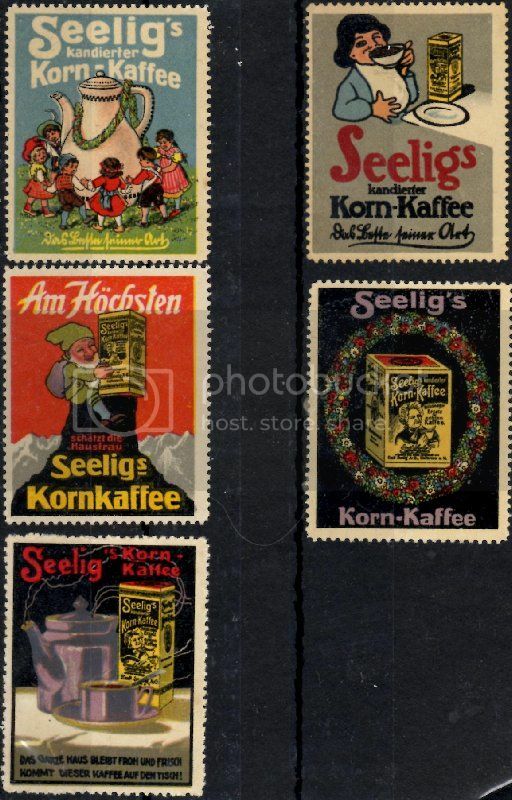 These are from Aecht Franck, the firm which took over Scheuer in 1928, and again promotong a coffee additive, which apparently is the housewife's favourite (but don't tell the Herr of the household). They show a selection of children's story characters: Tom Thumb. Max and Moritz, Puss in Boots, the Frog King, Shock-headed Peter and Little Red Riding Hood. The Shock-headed Peter illustration is the one from a 1917 edition of the Heinrich Hoffman book, which gives us the period. From the likeness of the illustrations I'd guess there was a set of books featuring each of these. I'd not heard of Max and Moritz before. Seems they are a pair of boys who play pranks on the elderly, nearly killing them or stealing their food. They get their come-uppance when they get ground up by the miller and fed to the ducks. Just love the German sense of humour. 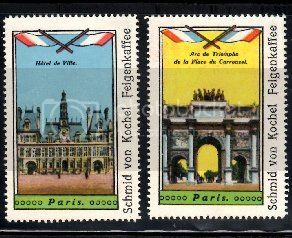 Certainly prolific, but tese may have been issued over at least a couple of decades. I have a feeling that any reference work that lists these would cost most more than collecting them. 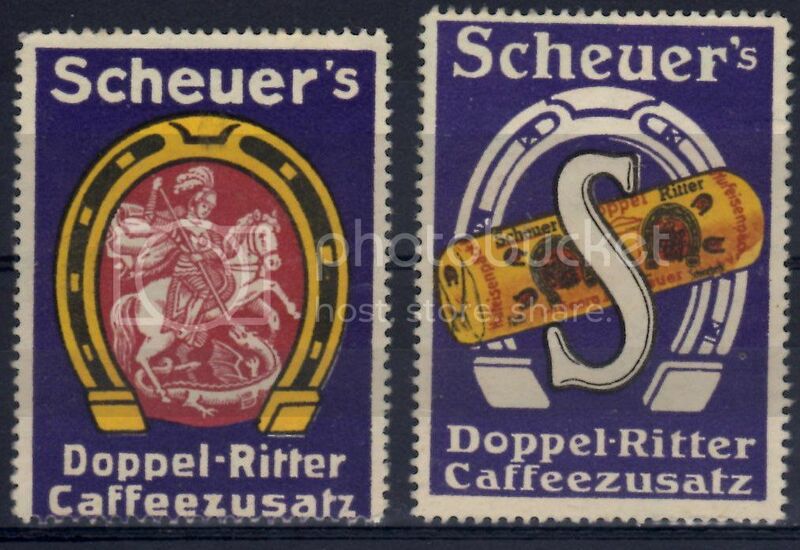 Some labels from yet another German coffee producer. This time it is J.J. Darboven of Hamburg who started in business in 1886 and seem to be still brewing strong. 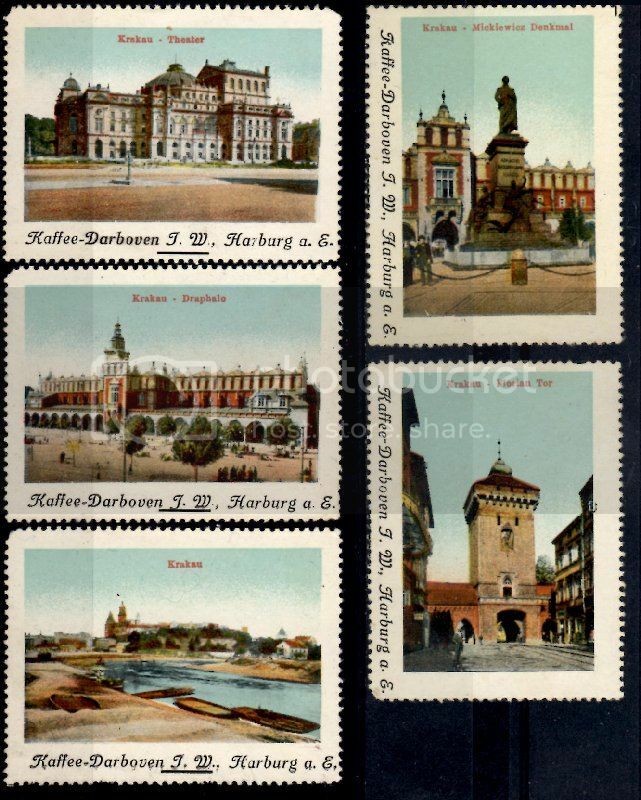 The labels show scenes of Krakow in Poland. 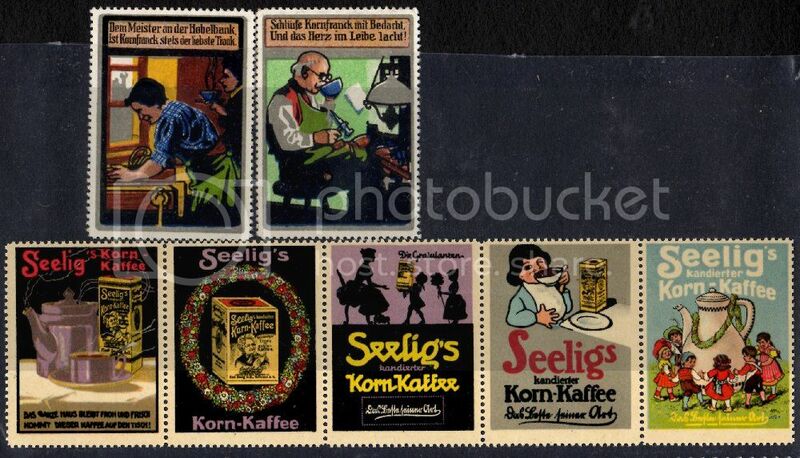 I have been steadily adding to these Coffee flavoured poster stamps. Here are some from the Netherlands. 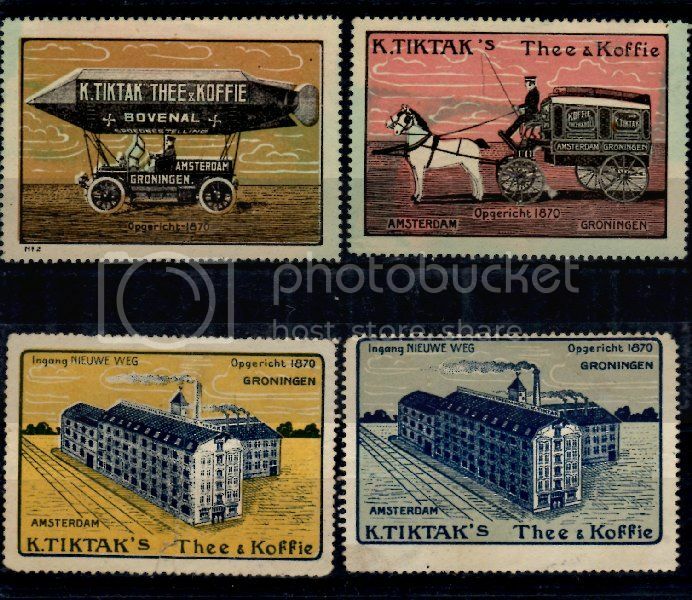 Klaas Tiktak's Coffee was founded in 1870 in Groningen and is still going, though now under Italian ownership. 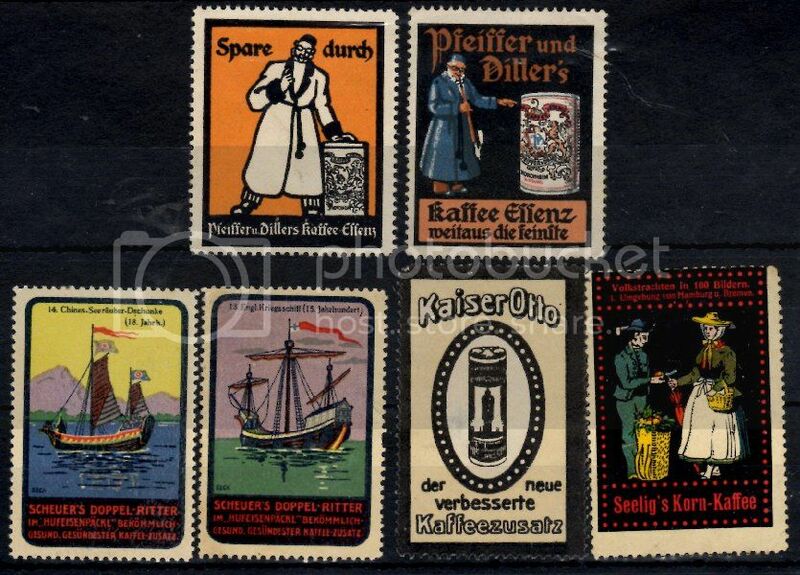 They are well known for their advertising and the stamps are just an example. They would date to after 1911 when they expanded to new offices in Amsterdam. 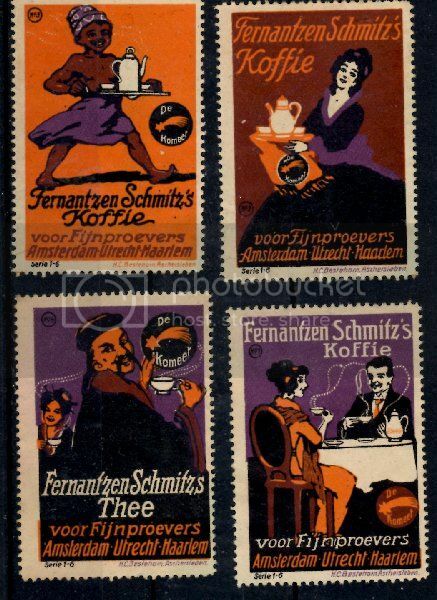 Another coffee, or rather ersatz coffee, producer's advertising/collector's stamps. Schmid von Kochel is the brand name and refers to The Blacksmith of Kochel who is a figure from the Bavarian legend that today, especially in Upper Bavaria, is regarded as a folk hero. According to legend, he is a soldier in the wars against the Turks ( second Siege of Vienna have been) and armed only with a rod. 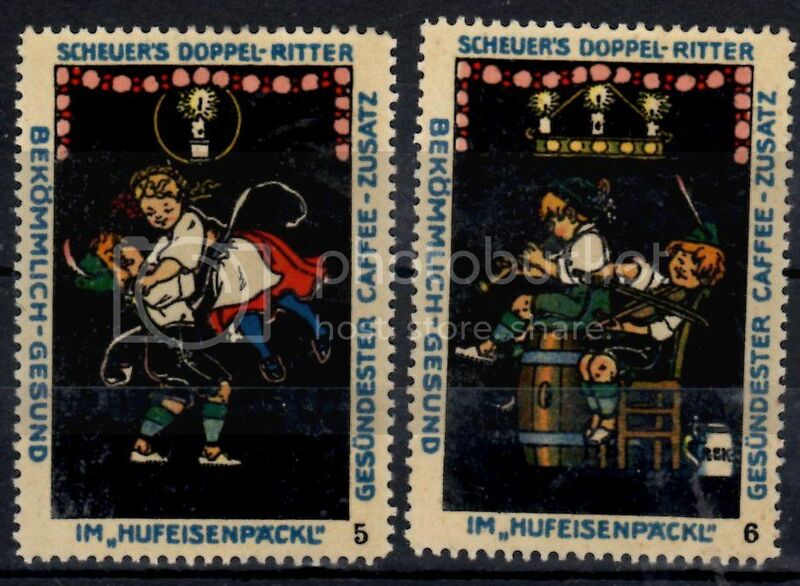 I am still accumulating these coffee inspired poster stamps.